Speaking in India, PA chairman says a peace agreement will help the fight against terror. Palestinian Authority (PA) chairman Mahmoud Abbas, who is currently visiting India, met on Tuesday with Indian Prime Minister Narendra Modi and President Pranab Mukherjee, and asked them to support the two-state solution. "We are striving to implement the two-state solution within the 1967 borders, that is, an independent sovereign Palestinian state with East Jerusalem as its capital living in peace alongside the State of Israel." "We hope that the Israeli Prime Minister will accept this invitation to realize peace. As I have said many times, I will reiterate my words that we are ready and reach out in order to achieve the desired peace," he added. 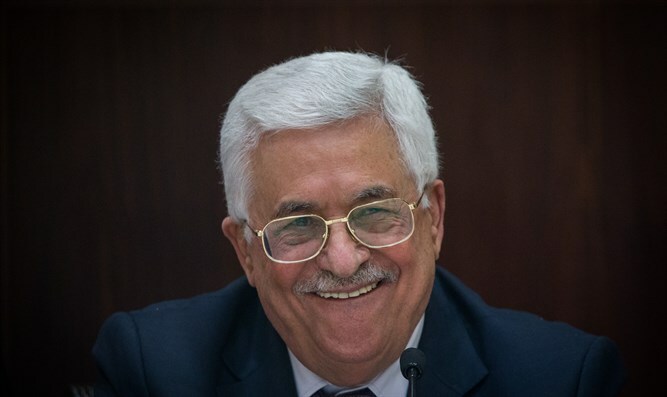 "The solution of the Palestinian problem and the end of the occupation will greatly assist in the fight against terrorism in the region, since the implementation of justice is the basis for success in the war against terrorism carried out by terrorist groups such as ISIS and other extremist organizations operating in our region," claimed Abbas. The PA chairman’s visit to India comes ahead of U.S. President Donald Trump’s visit to the Middle East next week, where he is expected to meet with Abbas and “express his desire for dignity and self-determination for the Palestinians”. In the past, Abbas has rejected calls by Israel to sit down for direct negotiations, choosing instead to impose preconditions on such talks. He did indicate last week, however, that he was willing to meet with Netanyahu, if the meeting was under the “auspices” of Trump.